This morning I started my day by deadheading the flowers in my garden . This daily routine gives me time to think and plan ahead. This week I am preparing for my demonstrations at Patchings Art Festival which takes place next week. I love Patchings! Its' a place where everyone who loves art and crafts unite in the warmest and friendliest of surroundings. I have been invited by St Cuthberts Mill who produce my favourite watercolour paper , Saunders Waterford , to demonstrate as a celebrity guest artist in the main festival marquee. I will be demonstrating on Thursday, Friday and Saturday. I also have my own marquee where I will be happy to sign copies of my books which will be on display and for sale. For new comers, please note that buying tickets in advance for my demonstrations is a wise idea as they can sell out on the day. At the foot of this blog post is a link to help you if you wish to purchase tickets. 1) Buy your demonstration tickets on line in advance to make sure you get to see your favourite demonstrations! 2) Do come to this event with cash or cheques as not every stand will be taking credit cards. 3) Part of me wants to say do come wearing blinkers so that you don't buy everything BUT.... don't wear these in the Daniel Smith marquee where all my favourite colours will be available! 4) If you can't carry everything make notes of products you wish to try and make sure you know where to purchase them from. later. 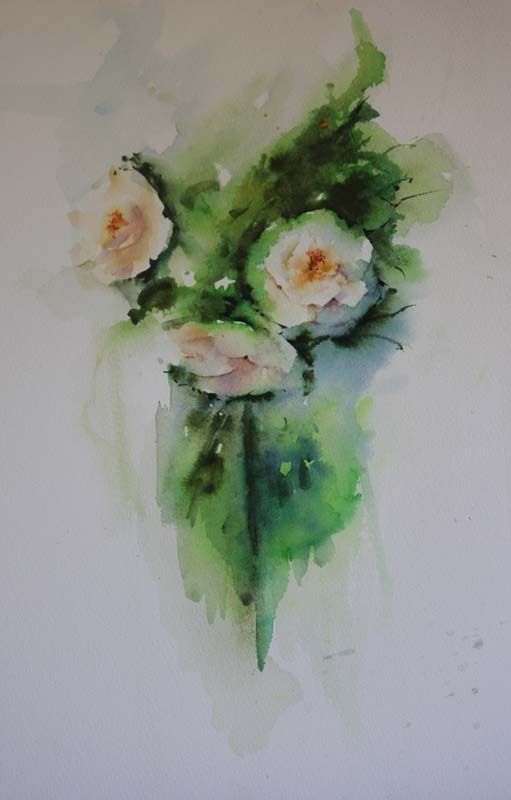 But now back to my painting of white roses, why is the title "All White "? Because I have so much to do this week that I am reminding myself that everything will be "all white on the night"! I started the above painting by placing three shapes for flowers as white spaces to form the flowers and I created a background around them using Daniel Smith Green Apatite Genuine and French Ultramarine Blue. The centre of my flowers are created with Aussie Red Gold, highly diluted on some of the petals to add a sense of warmth. The first stage is seen below and detail has been added in the above painting which is yet to be completed. 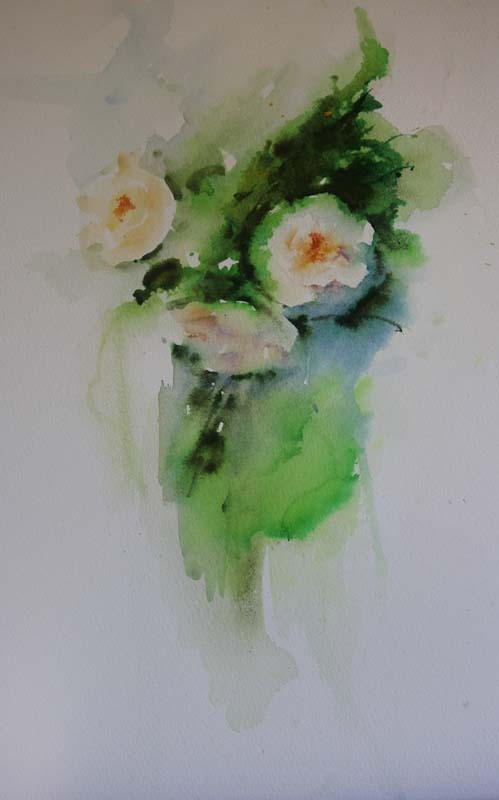 If you have my new book " Atmospheric Flowers in Watercolour" you will see the white rose paintings included in it along with composition ideas. But now I must get back to work preparing for next week. Do please say Hi if you come to Patchings as I would love to see you! To buy tickets for my demonstrations please see the link below for full information.